This is the image I had in mind when I read the post at Highly Allocthonous early last month, that started me off on my own meanderings about the digital divide, that I am now closing the loop on. From my side of the divide there is a certain amount of sediment that is being transported by the river of flowing time. I was 13 in 1945, living in Los Angeles, having been moved there with my family from a little town not far from Charlotte, North Carolina. My mind was certainly not on meandering streams. Vicksburg, Mississippi is indelibly associated in my mind with images of the civil rights struggle subsequent to 1945 that my wife and I were involved with, just as Dow corporation is associated in my mind with images of napalm and agent orange from later years. All of which should have nothing to do with doing geology or teaching geology or being a scientist or blogging about any of these. Even so, it prompts me to wonder what was in the minds of those people in the photo. Men, apparently. Perhaps even Friedkin himself. Individual motives cannot be read from photos, but institutional rationales are a little safer to surmise. That is, the people who payed for this research I think we can be confident about. They were out to control the river. First understand, then control. We understand from this side of the divide that achieving that goal is not only undesirable, but is quite likely impossible. Perhaps a little too easily we attribute to the people in the photo aspects of vanity, arrogance, even hubris. Perhaps a little too easily, I reacted the same way to the Post and its comment stream. But a question lingers. Does restoring the river come down to controlling it, to making it move backward through historic time to some earlier ideal state? Ideal state? Whose ideal? Who has the authority to define the ideal? Whence comes that authority? Questions as old as the human community itself. Meandering across the digital divide IV: what causes it to wiggle in the first place? In my mind, streams follow a sinuous course, in single channels or multiple, even within fixed walls, because the flow is turbulent, perhaps following some demands of chaos theory. So I wondered what new stuff has developed over the years about sinuous fluid flow, turbulent flow versus laminar flow, chaos theory and so forth. I can’t remember how I got there, but I was looking at a map that showed the avulsion of the meandering channel of the Owens River. So I had to look up avulsion. Great word! It led me to the book “Tectonic Geomorphology”: Burbank and Anderson (2001), which I went to Amazon and ordered, along with “California Rivers and Streams”: Mount(1995). I also have “Braided Rivers”: Best & Bristow ed (1998) coming from the Geological Society of London. Going in the other direction, I dug out my Leopold “Fluvial Process….” (1964), and some other stuff:(Russell-“Rivers, Streams and Seacoasts”1967; Birot “The cycle of erosion in different climates” 1968). I guess there are two places I tend to go to for answers:old books in my basement and new stuff through my computer. Meandering I go, back and forth across the digital divide. But what causes it to wiggle in the first place? I searched for Prandtl, not knowing anything about him. He was a pioneer in aerodynamics in the early 20th Century. Boundary layers and separations thereof, subsequent forces. Wikipedia has a nice piece on turbulent flow and laminar flow. I clicked on a “See Also” topic titled “swing bowling”. It sounded too much like swing dancing to pass it by. Turns out it is a cricket phenomena where the bowler causes the ball to deviate sideways (wiggle?) by heaving it at just the right speed to keep the airflow over half the ball turbulent and the other half laminar. The ball, which has an equatorial seam, is kept half rough and half smooth by the players in the field. The sideways force comes about because the separations of the boundaries layers on the turbulent side and the laminar side don’t line up. I think I have that right. In a stream, what corresponds to the two sides of a cricket ball? I taught that in a stream one can distinguish a laminar flow layer at the contact with the un-moving bed of the stream. As velocity increases away from this surface, at a specific velocity, the flow abruptly changes to turbulent. Then, as flow velocity continues to increase, the flow again changes abruptly to jet flow. Typically, this occurs at the surface along the thalweg. 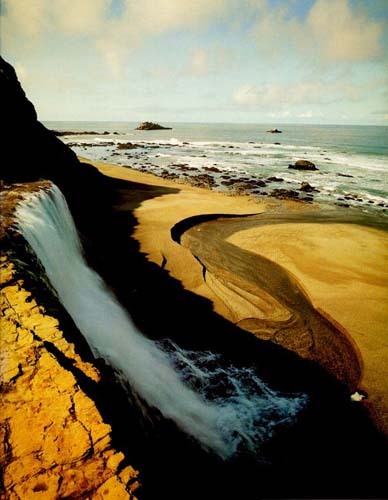 Rethinking this now, I wondered what was jet flow, the flow that produces those smooth standing waves on the surface of even small streams, like the one at Alamere Falls? Of course it looks like laminar flow, but it is going too fast, faster even than the turbulent flow. But fast relative to what frame of reference? For a packet of water moving down the thalweg, the source of friction that would produce turbulence is not the bed of the stream, but the water packet immediately beside it, which is traveling at nearly the same velocity! 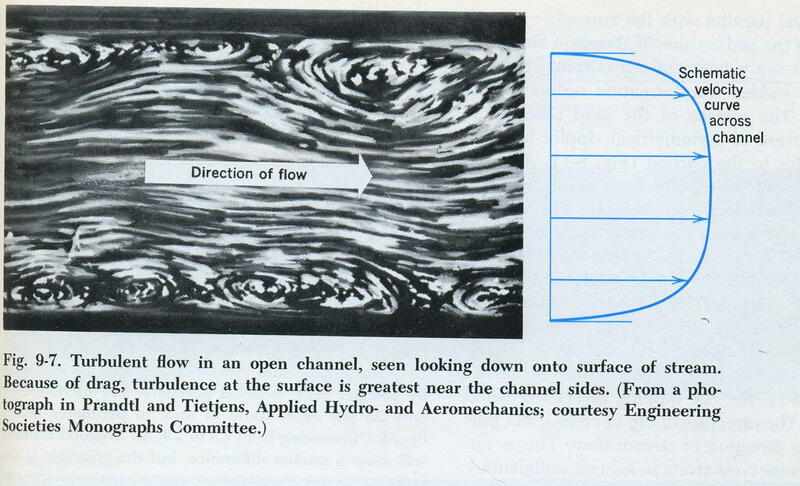 The jet flow portion of the stream is an elongate lake being carried downstream on the rollers of turbulence. Any flow within it is laminar! Somewhere in there in the separation of boundary layers on the two sides of the turbulent flow zone sandwiched between the laminar flow at the bed and the laminar flow at the thalweg, those swing bowling side-wise forces arise to start the stream to wiggle! I believe it! But then I’m just an old igneous petrologist from the geosynclinal era gone to seed in the classroom, now out to pasture. My teaching was clearly rooted on the other side of the digital divide from here and now. In it I developed a fairly consistent program for using meandering streams as a means of teaching how geology goes about answering its basic question (how did the Earth get to be the way it is?) by bringing to bear the non-historical sciences, in this case physics. I started with an in-class problem. The students got a piece of paper with a meander loop drawn on it, and a data set with depth and water velocity. As I recall now I stole the data from something of Strahler’s. Actual stream gauge measurements. That required some explanation of measurement and operationalism. The students plotted the depth profile and the velocity profile across the meander loop. Needless to say, there was a close correlation: deeper water on the outside of the curve, running faster where deeper. 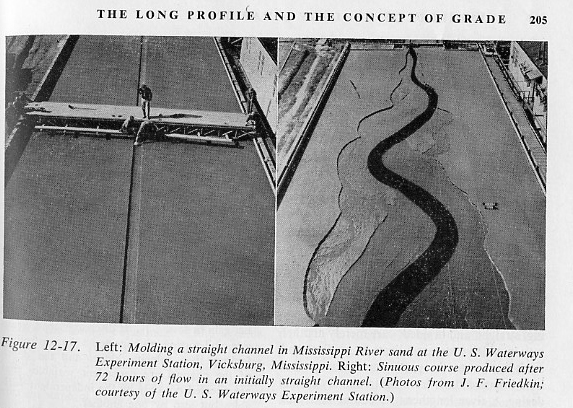 Generalizing from this, I showed them how to draw the thalweg down the length of the stream shown on the map, completing the three-dimensional view of the inter-relationship of process and form. The next step was to, hypothetically, dump a load of mixed size sediment into the river at the thalweg on the cross-section and follow it downstream, using the stream competency diagram (particle size vs stream velocity). I had to resort to drawing my own version, even if there was one in the text. With it by interpolating velocity at max at the thalweg to zero at the bank, the students could figure out where to look for the sediment: on the next point bar downstream on the same side of the thalweg it started from and sorted out by size. In the interests of saving time during the term, I dropped the in-class problem aspect and just lectured my way through these ideas. That doesn’t work nearly as well, but I needed to save the time for my other problems that I thought were more fundamental to geology- eight in all. The mysteries of log-scaled graphs, interpolation, and diagrams that show process but are too easily conflated with form just took too long to unravel. After I felt that I had the students mind thoroughly into the stream, I went back to the cross-section and started talking about the actual point to point velocity and how that could be measured. I re-introduced the turbulence, showing where it maxed out on the outer part of the curve, below the surface, not at the bottom, sometimes with some helical flow. Then, with the bald assertion that the velocity plotted in the competency diagram was a surrogate measurement for the degree of turbulence, which we did not know how to measure, I further asserted-teachers in a classroom can get away with crap like that!-that if the stream was eroding, the point at which the erosion occurred was where the turbulence was maximum where, in turn, velocity changed the most in the shortest distance. That is, below the water surface, on the outside of the curve, not at the bottom. Sediment removed from that point would leave the unconsolidated material above it un-supported, and it would collapse into the stream. All this stuff would be carried downstream to the next loop and depositied on the point bar, sorted out according to size. Frequently there were students who had swum in rivers, knew where the beach was and where the swimming hole was, and could testify about walking into the water over increasingly coarse sand, pebbles, etc. The net result of these processes operating was the migration of the asymmetric profile sideways, leading to the side-cutting action of the stream and the accentuation of the meander loop, etc. By introducing some speed-up and slow-down of velocity around the loop, down-valley migration can be accounted for. Oxbow lakes, clay plugs resisting erosion(back to the competency diagram): it fits together beautifully. Occasionally you can see the click on the face of the student when all the various pieces of the puzzle fall into place. All of this leads easily to saying that once the form of a meander is established, the process that occupies the form will re-create the form continually. The only remaining question was what caused the stream to wiggle in the first place. 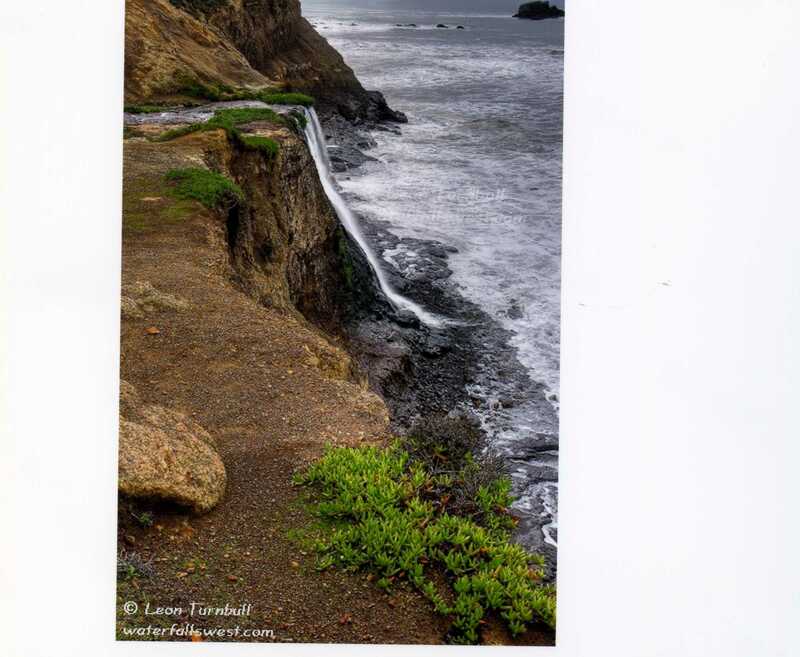 I then went through the familiar examples from Leopold’s work of melt water streams on glaciers, the Gulf Stream, the jet stream in the atmosphere, even adding my own favorite examples, streams flowing across beaches, like at Alamere Falls. I could say at that point that meandering seemed to be an inherent property of fluids in turbulent flow, so we have to await a further understanding of turbulent flow from the people who are responsible for that sort of thing, the physicists. Uncomfortably, the above development implies that all streams should meander. So that required some work on the conditions that rule in non-meandering streams: braided streams (variability of sediment load and discharge) and riffle and pool streams in canyons (flowing water can’t cut sideways into bedrock- the cutting tools are all in the bottom. They are doing the best they can.). Meanwhile, geologically speaking we could say that the observational evidence indicates that we need refer to nothing beyond the current on-going process to explain the existing form. The independent variables in a stream system are the discharge and sediment load, which are both determined basically by climate. The internal dynamics of the process adjust the form to meet the needs of uniform dissipation of energy. While the process can approximate balance or equilibrium or steady state at the local time scale, so long as there is land above water, the planet Earth is not gravitationally in a stable configuration, and will continue to change at the global time scale. The internal energy residual and generated within the Earth is now, and has for nearly 5 billion years, acted to counter the force of gravity, fueling the continuing and shifting interactions at the surface of the Earth that we call geologic history. Having spent the last four decades in front of a classroom, dealing with the structured ignorance of the students, I am a little intimidated by the staggering amount of new knowledge the scientific community has compiled while my back was turned, facing away from learning and toward teaching. To be a little more precise, I have been learning, but the thing I have been learning about is hidden behind that phrase “the structured ignorance of the students” and how that clashes with the fundamentals of science. In this process, I have been forced to re-learn those fundamentals again, but trying now to look at them from the point of view of someone who is, consciously or unconsciously, committed to a radically different frame of reference. But that’s not this story! In his book The Step to Man, John Rader Platt predicted in 1966 that the time would come when there would be enough computer memory available that every thing that had ever been written could be stored digitally for our retrieval. As I recall he also posed the question that the technology evokes: what to keep and what not to. We are close to being there and certainly are dealing with the question. I ran into it while trying to locate a favorite article of mine: Bela Julesz: Cooperative Phenomena if Binocular Depth Perception (American Scientist Vol 62 No 1 Jan-Feb 1974). I knew I had it on my bookshelf, but I couldn’t remember the date or the author’s name. All I had was the notion that I could remember the cover picture, if I saw it. Turns out I did. It’s a sea turtle. But rather than committing myself to searching through all my back issues, I thought I would let google take a stab at it. So I put in “random dot stereograms” and came back with Julesz name. I went to the American Scientist website and put in Bela Julesz, and got NOTHING!! Now that is a crime, and a lesson of some sort. So I started leafing through the back issues on my shelf, searching now for Julesz on the content page. Got it! The thing about this article is that it reproduced an almost full page random dot stereogram, paired red and green dots arranged by computer in stereopairs on an arbitrary geometric surface, accompanied by red and green lensed filter. You hold these filters over your eyes and wait while the brain begins processing the data. Minutes go by, while this goes on. Slowly, the form begins to emerge. Finally, you see the whole form. You can almost hear the two sides of your brain chattering away about which red dot goes with which green dot to produce a coherent form. It is a very convincing experience that says you see the world as a constructed image. I have re-checked the image and my eyes can still construct the form relatively quickly, though not immediately after several years-since the last time I did this. But the article was not reachable by searching the Sigma Xi/American Scientist site. At AAAS you can access John Platt’s piece on Strong Inference, and T C Chamberlain’s Multiple Working Hypothesis classic. You can read Leonardo’s handwritten notebook. So it’s easy to think that you have available a world of literature. And it’s easy to get to. Unless someone who has a budget to cover it, and the sense to recognize its meaning, material produced prior to the digital revolution can be left un-scanned on the shelves, somewhere in the stacks. But who has un-prioritized time to meander through the stacks just looking at not looking for? Well, retired old men, but who else. Compounding the situation in geology is the coincidence of the digital divide with the conceptual divide generated by the avulsion-I just learned this word, as it applies to meandering rivers making major changes in course- from Geosynclines to Plate Tectonics. It is easy for the younger generation to feel that there is nothing meaningful to look for back in the stacks. That makes it easy, in turn, for a person from the older generation to complain about the contradiction of students of a historical science ignoring the history of their own science. Fortunately, science types learn that doing hard but meaningful things can be a lot of fun! 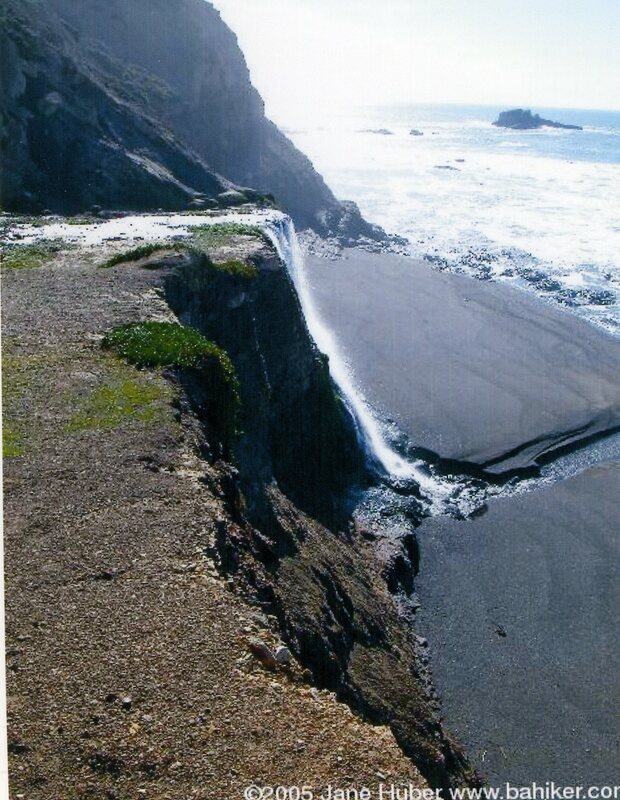 Here is another photo of Alamere Falls. The stream here is running straight down the steepest slope, fulfilling the common expectation. Earlier this month, I made a comment on Highly Allocthonous and followed up by posting here the scanned photos below. Subsequently, I removed the photos and am now returning to the project. As is usual for me, I am writing from a title, not knowing exactly where it’s going, but with some confidence that it is going somewhere. Meandering, in a way. But then the sinuous movement of flowing fluids themselves are the consequence of not of complete disorder nor of a form imposed on it externally, but rather seem to be an expression of some aspect of turbulent flow. Turbulent flow, of course, is in the domain of physics, somewhat to their chagrin. I have been happy to leave the subject there in my teaching of introductory geology. The digital divide is not so simple either. I have encountered it within the faculty of my college, certainly within the classroom, in my doctor’s office, anytime one does some kind of literature search. I wondered when I made the comment if the image that I was familiar with was, in fact, across the divide from the author of the post, who gives every impression of being diligent, competent and energetic in her pursuit of science. From the response, I tentatively conclude that was indeed the case. The digital divide is multidimensional, and I will do some more meandering around it. Perhaps there is a basin along it somewhere. I didn’t know that there is a basin in the Continental Divide until I was driving through Wyoming on day. Singing a Sara Carter song, actually. For now I will leave you with a favorite photo of a meandering stream from a 1979 Sierra Club calendar (by Steve Manning). Alamere Falls, Pt. Reyes, California. I have been playing with some time-lines, working on a 11×17 sheet that ranged through the last 10,000 years. It occurred to me to show on this graph the time periods covered by some books I have been reading lately. That is, to show the range of time that each book covered. My immediate reading was The Trial of Socrates: I F Stone, but the first book I lined out on the graph was The Horse, the Wheel and Language: David Anthony. Then I tried to put on one of my favorites, The Universal History of Numbers: Georges Ifrah, but it turns out that people have been symbolizing numbers a lot longer than we have been symbolizing word-sounds, so that I could not put them on the same graph. The first recorded numbers were notches on sticks. The first written numbers were quite possibly words, rather than number symbols, which, in turn were quite possibly also the first words. Since that time, words and numbers have drifted apart into their own academic departments. Too bad! According to Ifrah, the Brahmins who shepherded the number system that became ours across the threshold from oral to literate cultures asserted that the numbers had no history. They were simply given to the Brahmins by the gods. Plato said much the same thing about the spoken language as he and the other Greeks accomplished the same task for the spoken language. We can follow the history of numbers through the mysteries of e, i, pi, 0 and -1. But what about the history of language development? By the time 2400 years ago when Aristotle recorded the rules of grammar, logic and rhetoric, the spoken language had been evolving for perhaps 800,000 years. Most of us ordinary people are still laboring to catch up with Aristotle. Only in the time since then we have been able to look at written math symbols, apply logic to their manipulation, invent algorithms and equations like Euler’s. Before venturing into some philosophical exploration of the meaning of all that one should recognize that natural selection did not produce these linguistic goodies for the sake of philosophy. Rather, there was some practical problem that they resolved in some way. And the resolution of practical problems only has to reach the standard of practicality. They don’t have to be “The Truth”. History begins, according to scholarly historians, with the written record. This statement is, in itself, evidence of the first phase of the history of civilization, the establishment of the hegemony of the written word. That is, it is an example of the expression of the primal power struggle that is characteristic of human societies, amongst others. In this case, the power struggle was between an established power elite whose power was based on oral skills and an aspiring elite-Plato and his group- whose skills were developing with the then new technology of writing. The first major phase of our history involved just exactly that: the overthrow of the older, oral based culture with the newer written based culture. The rise the monotheistic “religions of the Book” were an integral part of the struggle. But the very success of the enterprise generated problems, for the establishment of “the Book” raises directly the question of “Which Book?” The answer to that question was, obviously, “Our Book!” The struggles to establish one Book have followed down to the present time in what can be called the second phase of our history. That struggle was to establish the hegemony of a particular Book over all others. I call this the struggle to establish the hegemony of a monolithic orthodoxy. This is the struggle that dominated the 20th Century, and still goes on. But the struggle is in vain, for the world view that any orthodoxy displays is but a virtual world created in the mind by the flow of words. The words may map the terrain of reality with great effect for solving particular problems, but those maps are not the reality that actually exists! There is always some aspect of the existence that escapes or is ignored by the word-makers, and ultimately that reality will dismantle the theory the orthodoxy is based on. One cannot give up and go back. The asymmetry of time forbids that. One can go forward, understanding that orthodoxies are but special cases of a more general phenomena- plagiodoxy. Further, that multiple plagiodoxies give better perspectives on existence than any one of them. We may not be able to solve the problems we are faced with, which the sales pitch of the orthodoxies claim to do. But we will stand a better chance with a clearer image of the problems themselves.